My blog looks at the archaeology and heritage of sites in Tipperary and surrounding areas. As many of these sites are on private property, it is important to request permission from the landowner before entering private lands so that access does not become a problem across all sites. 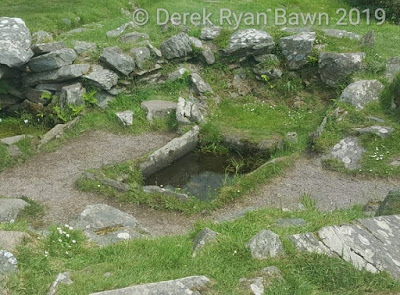 There has often been debate as to the function of Fulacht Fia or "cooking pits of the fianna" that are dotted around Ireland. A new technique that was used at a rescue excavation at Errarooey More in Co. Donegal has allowed what was in "the last boiling episode" to be analysed. "The lipid analysis suggests that a variety of plants along with large herbivores (possibly deer/cow) were processed within the trough. Interestingly, common vetch (Vicia sativa) and wild mustard (Sinapsis sp.) were recovered from the fill of the trough. Both species are anthropogenic indicators and have uses as a foodstuff in the archaeological and ethnographical record." (Hawkes & Malainey, 2018, 50, Archaeology Ireland, Winter Edition 2018). The fulacht fia was dated to 2187-1898 BC. There are records of at least 180 fulacht fia's in Co. Tipperary. Below is the fulacht fia at Drombeg in Co. Cork. This blog is researched & written completely on a voluntary basis.